Kentucky’s Ron Lehocky happily received a bin full of other artists’ scrap clay recently. He’s begun turning those discarded canes, experiments and leftovers – our “lemons” into “lemonade” for the KIDS project. Take a look at what Ron can do with failures and leftovers! In some of the photographs he’s inserted the original cane to illustrate the transformation. Ron first separated the donated clay into two piles -definitely scrap and scrap with potential for reworking. All will end up as part of the project, either on the surface or inside the heart pins. Transforming canes is an enjoyable challenge for Ron as he cranks out heart number 15,945! At $10 each, it’s easy to calculate how much he’s raised for the childrens’ center. Ron wants to pass along a big thank you. Read previous posts about the project here and contact Ron here. He would love feedback from anyone who recognizes their scrap. I am simply open-mouthed with astonishment–not only at the beauty of the work, but the fact that this extraordinarily generous man is SO prolific! a working physician, AND he finds the time to create thousands of artworks for charity?! How humbling. How inspiring.Go Ron! Absolutely amazing!! What a gifted mind God has given him! They are gorgeous! Definitely will try to think more creatively about my scraps. Thanks for the inspiration! Wow! How inpsiring. One mans trash really is anothers treasure !! There are a number of wonderful life-lesson metaphors and stories in there somewhere, peaking out, waving their hands, laughing with joy. Inspiring! Whenever I have a person in my grasp who’s new to polymer, my first line is always, “Nothing goes to waste in polymer clay!” What an inspiration Dr. Ron has been to us. Thank you, Cynthia for reminding of this wonderful humanitarian! Every fiber of my being is smiling at your incredible gift, Ron!!! You’re talent, generosity, and spirit truly inspire me. I so respect you in so many ways. Hugs to you my friend! WOW! This is inspiring on so many levels! A good guy and obviously very, very talented, too. I always tell my students not to throw away their scraps — I can’t wait to share this link with them for inspiration! Absolutely beautiful, both the designs and the shapes — who knew puffy hearts could have so many lovely variations!? 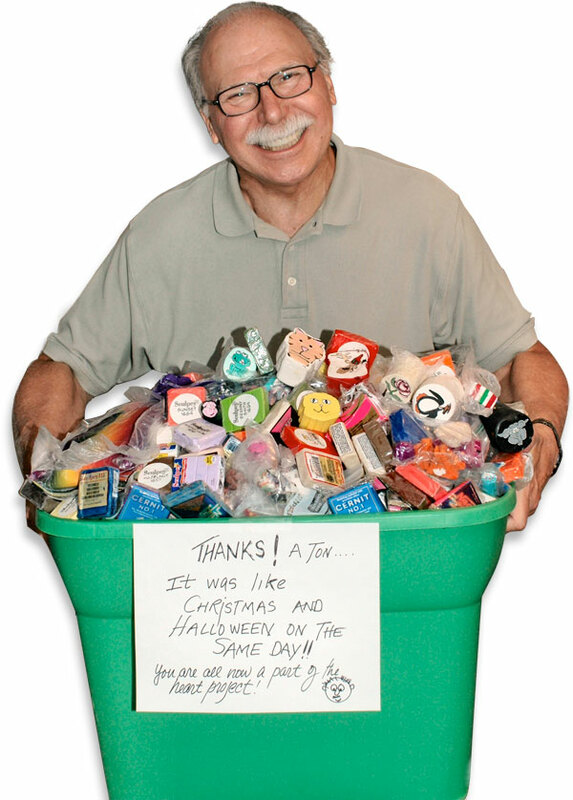 Ron is perhaps the most giving person in polymer clay. Makes me feel a bit guilty — might have to find something to DO about that! Ron is one of the kindest people I have ever met and he never stops being a doctor, even when he’s about to receive an award! Thank you, Ron! Ron never ceases to amaze with his energy, generosity, creativity and skill. I’d love to be a fly on the wall in his studio! Thank you so much for sharing this today. On a personal note – it’s a great reality check for me. What an amazing man. This is more than recycling, it is transformational up -cycling with a huge heart! Thank you Ron for everything you do to bring inspiration, joy and HEART to the world. Wow, those are wonderful and colorful and so unique. Love the whole idea. Ron definitely has a BIG Heart!! Kudo’s Ron! 🙂 Your generosity shines! Your talent amazes me! You are such an inspiration my friend! So nice to see you here, Ron! We are fortunate to have you as an inspiration. Not only that, but our guild (and community) would be a poorer place without your sense of humor, generosity, and hard work. Thanks, Ron, for all you do! this man’s power and love brings tears to my eyes. person and artist to this issue of PCD. You ROCK, man!! Most of us have to struggle to make something look as good as your “scrap hearts”! You, my friend, are an all around inspiration….KUDOS!!! Your work is amazing! Ron your heart is big that cover the world.